I would like to thank all of the musicians that appear on this album. It is always an honor to share the bandstand with you. To Terence Love, thank you for the many years of friendship and the opportunity to play and allowing me to experiment with my compositions. To my family, Wendy, Lauren and Julian, thank you for all the love and support. To Julian, although you weren't expecting to be on the recording, the band wanted to keep the track with your performance, because you did such a great job. To Tony, thank you for all of the help in the studio. To Frank, thank you for your artful mixing and mastering. To all the people who came out to see us play throughout the years at Steamers, much love! Recorded at Master Recording Studio August 2014, Tony Guerrero, engineer. Mix-and-mastered at Le Casino Studio by Frank Lenz. Sign of Our Times is a culmination of many years of playing together. During the past 20 years, the group has called Steamers Jazz Café in Fullerton home. During the last five years, I made a promise to myself to write a new tune every time we played at Steamers. The compositions recorded for this CD are a reflection of those works. Usually, the ink was still wet on the page when handing it to the band. I never really worried how it was going to sound, because I knew the guys would make it sound better than ever imagined. It's always an honor and a privilege to perform with these amazing musicians. Each song title has a story behind it. Before playing the tune for the first time, I would explain to the audience the origin of the title and it's relevance to the music. Since there are 11 tracks on the CD and 13 on iTunes, I feel the need to provide the listener an explanation about each tune. 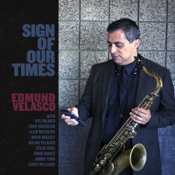 Sign of Our Times (Featuring Kye Palmer, Mark Massey and Ernie Nunez), the title track, is a fusion of Hard-Bop and Afro-Cuban music. When I was younger, I knew very little about Latin Jazz. Through Terence Love, owner of Steamers, I started working with the Latin band The Estrada Brothers. I grew to love the music and wanted to pay tribute to the wonderful performers of that genre. Endings are Just Beginnings (featuring Mark Massey and Ernie Nunez) is dedicated to my friend Kelly and my sister Arleen. They were both experiencing major changes in their lives, and I wanted to write something that was reflected their lives at that time. Although change is scary, I knew that they would through their tenacity and determination be happier and stronger from going through that experience. Mr. Palmer Drive (Featuring Kye Palmer, Mark Massey and Steve Venz) is a rather silly title based on a casual conversation with Kye. He and I were talking on the phone about how difficult it was for him to drive to the NBC Studio in Burbank for his regular gig performing with the Tonight Show Band. After I had hung up the phone, this tune popped into my head. Coping (featuring Llew Matthews and Ernie Nunez) is written based on a theme composed by Aaron Copeland…and not about dealing with one’s problems. If you listen to the melody, you'll hear it has many things in common with Aaron Copeland's Fanfare for the Common Man. While I was on a gig, I heard a trumpet player warming up playing the fanfare. I thought it would be funny to do it in minor and play it back to him. He laughed and said, that he thought it would be a good tune. And so, another tune was born. If You Feel It (featuring Mark Massey) is a tune I dedicate to my father, Fred Velasco. When I had told him that I wanted to major in music at college, he said, “That’s fine if you feel it's the right thing to do but have something else to fall back on.” I didn't take his advice, and I think he didn’t mind. The Next Chapter is dedicated to my wife Wendy, my daughter Lauren, and my son Julian. With the kids attending college, my wife and I were left with an empty house. I felt that a new chapter in our lives was starting. Although I was happy for the kids, not seeing them on a regular basis was an adjustment, and I still missed seeing them every day. It has been an honor to be a part of their lives and watching them develop into beautiful, young adults. Carnival West is dedicated to one of my favorite saxophonist Sonny Rollins. This tune is strictly written in homage to one of the great giants of jazz. Rhumba Numero Ochenta (featuring Llew Matthews and Ernie Nunez) was written for my parents, Del and Fred’s, 80th birthday party. My parents love the sound of Latin music, so I wrote this tune for them to dance to at their celebration. It was also my first composition that I had written specifically for the flute, which was an oddity to be sure, considering my flute playing skills. Cornered (featuring Julian Velasco, Kye Palmer, Llew Matthews and Ernie Nunez) is a composition I wrote based on the changes to one of my favorite Freddie Green tunes called “Corner Pocket.” Back in the early days of Bebop, it was common to write melodies over existing chord changes to popular Swing tunes, so I thought that I would give it a try. Cha-Cha para Mi Padres (featuring Tony Guerrero, Llew Matthews and Ernie Nunez) is a tune that I wrote specifically for my parents after they requested many times to hear “Cuidado,” a tune that I recorded on a previous CD. The Cha-Cha is something that became very familiar to me due to playing with The Estrada Brothers. I've learned to love that style of music and wanted to try my hand at composing in that style. See You Soon, See You Later (featuring Mark Massey and Steve Venz) is a tune I wrote for my wife, Wendy. She is always calling me an “eternal optimist,” while she claims to be a “realist.” At the end our phone calls to each other, she will sign off with saying, “See you later!” and I will answer back, “See you soon!” I thought this was funny and decided to write a tune for us. Endings are Just Beginnings-bonus track (Featuring Steve Venz) is just that, a bonus track. We were waiting for pianist Mark Massey to arrive for our recording session (typical bad L.A. traffic) and I thought it might be fun to record this tune as a trio. Originally I was not going to release it, but everyone convinced me otherwise. On all tracks, Jimmy Ford plays the drums and Chris Williams plays percussion. I sincerely hope you enjoy this recording and look forward to seeing you soon at one of our live shows. Peace. For a printable PDF Downloadable version of liner notes, click here.